In the first part we talked about new features accessible from main application screen, so now I’ll tell you what’s new in the menu and about Web Console. Actually besides the new design there are not so many changes. 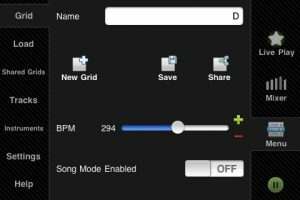 One of them is possibility to export recorded tracks in uncompressed WAV format (previously only AAC compressed files could be exported). 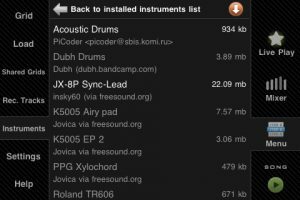 List of additional downloadable instruments now has special button to automatically download all missing instruments for the current project. Sort by rating in Shared Grids now works better taking into account number of ratings too. And finally most awaited new feature in this version in Web Console. It currently has three functions. First, it allows users to send crash reports in case of application crash. This will help me to diagnose and fix problem. 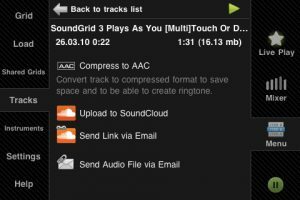 Second, it’s possible to download recorded tracks from Web Console. This is especially useful for downloading uncomressed WAV files because it’s usually not possible to send so large files via email. 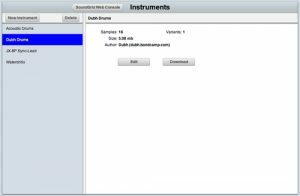 And lastly (and actually what it was created for), Web Console allows you to manage instruments, including uploading of your own samples to create new instruments. Not so much to comment here. 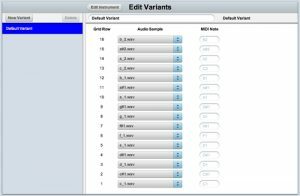 You can upload your samples to newly created instrument (uploading of many files at once in ZIP archive is supported), specify MIDI note name and/or sample name… …And then assign these samples to grid rows. Now creation of new instruments is very easy. 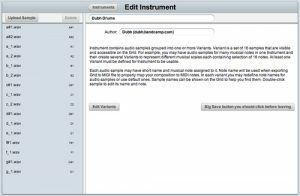 If you want your instrument to be publicly available, click Download button and then send me archived instrument.